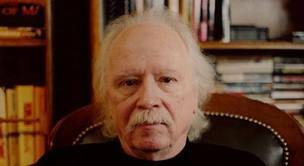 This is a recent picture of director John Carpenter, who is currently 63 years old. This is a picture of David Lo Pan. 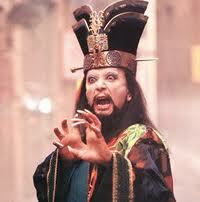 Lo Pan is a character from Carpenter's Big Trouble in Little China which is, all things considered, one of Carpenter's lesser known films. 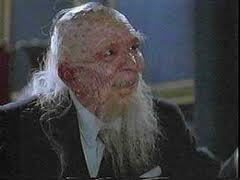 Lo Pan is an ancient sorcerer who appears either as a wizard-like character or the disabled old man seen above. I might be over exaggerating the similarity, but it would have bothered me to not share it through this post, which is part of the LAMB's spotlight on Carpenter. The above picture of the director is one that the LAMB used as well, and I first noticed the similarity when I saw it on their site. Weird thing to notice but, what can I say. Carpenter's getting older. Life imitates art. Don't get me wrong - I love BTiLC. Like I said, the film isn't as well known as Halloween or The Thing, but it's a great flick in my opinion. It's just the right combination of adventure and humor and, if nothing else, Kurt Russell turns in a hilarious and charming performance as smooth-talking trucker Jack Burton. contact the local authorities, as he probably has an evil scheme in mind. Have you seen Carpenter in BODY BAGS? Funniest/saddest thing about it is that he's pretty much playing the Cryptkeeper, and all he needed for the creepy part was coroner scrubs. Would love to see him in a Young Lo Pan outfit, though. Haven't seen that but damn he's ancient. He probably would become a wizard to be young again. By the way, dug your review of In the Mouth of Madness. I need to watch that again.